A full week of exhibition games in, and Mark McGwire is clearly not on his way to setting a single-season record for confrontational interviews. Not even TMZ-style ambush. “There is a lot of negativity and failure in baseball. It’s nice to talk about how positive it can be. I’m a positive person,” McGwire said. With that apparently not ironic use of “positive” there, presumably psychiatrists have just upgraded Mac a few notches in preparation for their upcoming Psychology Rotisserie Draft. But we move on. There are three ways to read the slow start to McGwire Season. Firstly, it’s just that, a slow start. The real tests start Friday when the Cardinals play the Red Sox, and then next Monday as they begin a virtual playoff series with the Mets (also Saturday, a week from Thursday, the 28th, and 30th – should you want to start circling your calendar). The players are irrelevant; the writers mattered. One can infer from giving New York’s Grouchiest five separate shots at Mac, that the schedule was either drawn up long before McGwire’s hiring, or somebody in St. Louis really doesn’t like Mark. The second theory is that McGwire’s return really is no big deal, positive or negative, and the writers have correctly gauged the spirit of the times. Since the writers only correctly gauge the spirit of the times once every 12.7 years (and when they do, 60 percent of them ignore it and write anyway), I’m not putting a lot of money on this one. The third one, I think, is the likeliest. Mark McGwire is simply being forgotten to death. The first evidence of this syndrome – a kind of psychological universal asterisk – was apparent when ESPN’s Barry Bonds Reality Show bombed. It did not generate controversy, it was not attacked as exploitive, it wasn’t even criticized as bad TV. It was just that outside the Bay Area and a small circle of other admirers, nobody wanted to hear from or about Barry Bonds, ever again. As if by a collective unspoken will: Barry Bonds hit more home runs, and Henry Aaron is still baseball’s all-time home run leader. Perhaps this invisible fog is now enveloping McGwire. Nobody’s raising a stink, because nobody takes him seriously. Maybe the Missouri Department of Transportation should have re-named the McGwire Highway after another former Cardinals hero: Roger Maris. Imagine if this had happened a little later in baseball’s history – it wouldn’t have been labeled “trivia.” When the Dodgers played an exhibition against the Braves in Vero Beach on March 11, 1967, two late, one-inning defensive replacements for Los Angeles included first baseman Sadaharu Oh, and third baseman Shigeo Nagashima. There’s even an Associated Press wire photo of one of the Japanese immortals, Nagashima, taking a throw as Atlanta’s Jim Beauchamp slides into third. The photo is not on the net, only in a digitized version of the Chicago Tribune’s hard copy, so it’s tough to be certain but it appears Nagashima is wearing not a Dodgers’ uniform, but his Tokyo Yomiuri Giants’ garb. Belated thanks to all who have posted comments lately with well wishes for my father, who continues to fight his illness, more than two weeks after he lost wakefulness, and more than six months after he was first hospitalized. Your support is of great value to me (and my thanks to MSNBC for its understanding in this time, and, for that matter, MLB.Com, for providing this oasis where I can immerse myself in the game between trips to his bedside). This is, in fact, what baseball is for. I’d also like to welcome new reader Bill Simmons, who has been kind enough to tweet about my note here last week already ceding him the dumbest sportswriting award of 2010 for his laugh-out-loud funny argument that the comeback of Tiger Woods (caught having repeated trouble with his putts) will be more difficult than that of Muhammad Ali (persecuted by the federal government for the color of his skin, his stance against the war, and his religious conversion, and effectively banned from his sport for two years). I’m furious that my Tiger column distracted America from a detailed and only mildly creepy case for Johnny Orsino’s Hall of Fame candidacy. This is pretty standard stuff for Mr. Simmons. Make a fool of yourself comparing Tiger Woods (loss of advertisers) to Muhammad Ali (loss of income, threatened loss of freedom), so change the topic – to an admittedly trivial column about a trivial moment from a marginal catcher named John Orsino. KO, please know the feeling is mutual. You’re my worst case scenario for my career in 12 yrs: a pious, unlikable blowhard who lives alone. This assumes that Mr. Simmons’ career now is where mine was twelve years ago (anchoring SportsCenter, then my own MSNBC political show, anchoring NBC Weekend Nightly News, writing a best-selling sports book, etc). In fact, this assumes that this is Mr. Simmons’ career, which is remarkable. Also, anybody who could write as many words without saying anything of consequence really should throw around the word “blowhard” as frequently as he would a street sewer cover. Also, I don’t think “pious” necessarily means what he thinks it does. I feel bad about saying Olbermann lives alone. I forgot about his cats. Mr. Simmons apparently uses, for factual research, old parody sketches from “Saturday Night Live.” I’m not surprised. That was Ben Affleck. Thanks for playing. I am surprised, however, to be able to shed some light on something that has been a prominent topic of late around the internet: the prospect that Mr. Simmons is leaving ESPN. Admittedly I am something of an authority on this process. Nonetheless, I was stunned to receive several emails from some of Mr. Simmons’ bosses there, thanking me for pointing out the absurdity of, and the embarrassment to ESPN provided by, the Woods/Ali comparison. About five years ago, I guess, somebody said Tony Kornheiser was the most uncontrollable, unmanageable talent in the history of ESPN. I was, of course, crushed (although I believe I got honorable mention). When ESPN bosses are writing me for helping them about somebody they claim has now lapped Tony and myself, I am left to conclude only that if Mr. Simmons does leave ESPN, it may not be entirely of his own choosing. And we now encourage Mr. Simmons to again falme the comments section under various identities, to his heart’s content. This is a managed site, and they can take ’em down. But enjoy yourself. Ah, the joys of spring training games showing up on my television, enabling me fleeting glances between hospital visits of a spring that here in New York seems a long way off. The first few exhibitions always make me wonder if any player ever made a greater debut than that of a fairly obscure catcher for the Baltimore Orioles during the exhibition season of 1963. In the preceding off-season, the Birds had moved on from the man who had been virtually the only catcher in their modern history, Gus Triandos, and were auditioning a kid with just 43 games of big league experience whom they’d gotten in a winter deal with San Francisco. Johnny Orsino had shown a power bat in the minors but was an unproven commodity as the Birds assembled in Miami 47 years ago. More over, he was hurt. A bad back forced him to miss Baltimore’s first six exhibition games. So his first at bat in an Orioles uniform on March 15th was by itself something of a triumph. Orsino promptly hit a three-run homer off Joe Moeller of the Dodgers. In his next at bat, he was accidentally intentionally walked (Boog Powell had been balked to second and manager Walter Alston was gesticulating wildly about the call; Dodger catcher Mike Brumley mistakenly believed he was being inexplicably ordered to walk his Oriole counterpart). In his third trip to the plate, Orsino hit another homer, a solo blast. He came out of the game at that point, and missed Baltimore’s next two exhibitions. But against veteran Reds’ lefty Jim O’Toole at Al Lopez Field in Tampa on March 18th, Orsino made it three homers in three Baltimore ups. Then four in four. Then five in five. You read correctly. Not just home runs in five consecutive official at bats, nor just home runs in the first five at bats of spring training, but five consecutive home runs in the first five at bats with a new team. The streak was finally snapped when a Reds’ prospect named John Flavin got Orsino to pop up to the catcher. Orsino’s unbeatable debut (What? somebody’s going to hit homers in his first six at bats with a new team, even in spring training?) got him considerable attention, and he had a strong season (19-56-.272) as Baltimore’s top receiver in 1964. But the bad back lingered, and he never again played in as many as 100 games in a season. 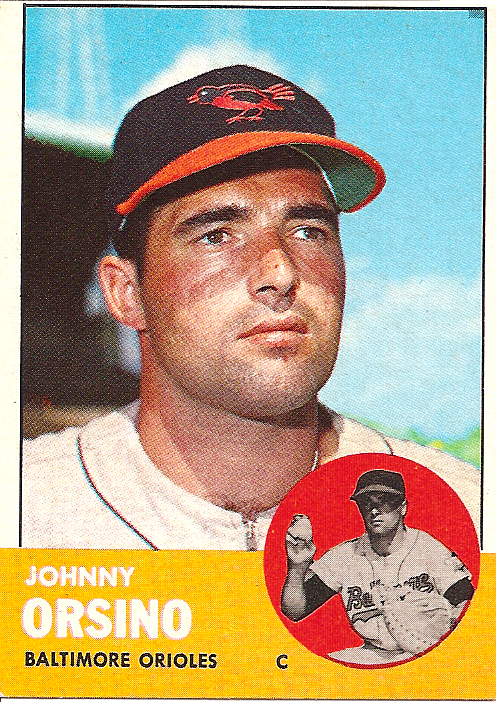 By 1966 the Orioles had dished him off to the Senators, and he spent all but one game of 1967 in the Pacific Coast League, and by 1968 was in Double-A. But the spring training world was his. It is largely forgotten now, but the Designated Hitter made its debut on the big league level not in 1973, but in a handful of exhibitions in 1969. And the first man to get a hit as “The Designated Pinch Hitter” was a non-roster invitee struggling unsuccessfully to catch on with the Yankees: John Orsino. I promised no politics here and I stick to it. But I never said anything about never mentioning other sports, although I think I’ll start that rule about a paragraph from now. If you’d like to read the most poorly-informed conclusion I’ve come across in sports media this year, you have your link. Proceed with caution. In short, it is the contention that the comeback of Tiger Woods will be more difficult than the one Muhammad Ali faced in the 1960’s. If the writer can let me know when Woods is punitively drafted by the military even though he is about eight years older than almost all the other draftees, I’ll begin to take him seriously. In the interim I am again left to marvel how somebody can rise to a fairly prominent media position with no discernible insight or talent, save for an apparent ability to mix up a vast bowl of word salad very quickly.